Jewellery worth £500,000 was stolen in an "audacious" raid on a shop in central London. Burglars smashed through a wall to get into George Attenborough and Son Jewellers, in Fleet Street, over the weekend, as The Sun first reported. A CCTV camera in a bookmakers next door was found to have been daubed with white paint. The Met said the high value of items stolen warranted a "thorough and determined investigation." Det Supt Simon Moring said: "This was an audacious burglary, and there are elements which appear to have been planned with some precision by the suspects." Photos taken from inside the branch of William Hill show a boarded-up hole in the wall. Former Met detective Peter Kirkham said: "Although this is not one of those things where only a couple of gangs could be capable of pulling it off, it would be above the average amateur burglar, some thought has gone into it. "There's probably some sort of alarm system they've had to deal with, so there was a degree of difficulty." However, Det Supt Moring said the break-in was "nowhere near" as sophisticated as more "high-profile" burglaries dealt with by the Flying Squad, such as the Hatton Garden heist. Only about £4.5m of the £13.6m of property stolen has been recovered after that raid during the Easter weekend in April 2015. 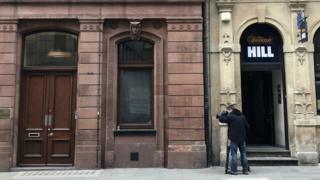 Hatton Garden: Who were the jewellery heist raiders? Hatton Garden raid: A pension job for Terry Perkins?